I've increased the angle by 2 degrees and the circle diameter by a fraction to make sure there's no actual way the area inside the torus can still be connected to the rest of the piece. I was planning on union()'ing this piece with another torus of the same size, because obviously the difference() would leave the torus subtracted. I just hadn't gotten that far yet because I can't make this work. The net effect I'm going for is that this piece is a support for a tailshaft. 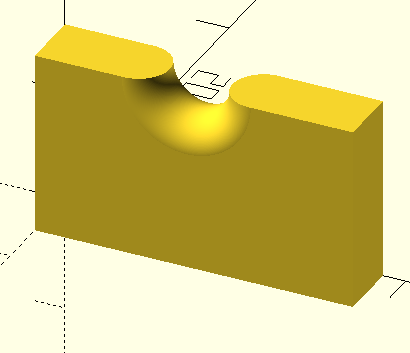 The tailshaft has a cutout that needs to rest on the inner part of the torus, but the outside of the torus needs to fully supported to make it printable. I may (probably!) be doing this the hard way, so I'm open to better ways to do it. Save a life; adopt a shelter animal. excessive processing time and doesn't (shouldn't?) affect the final result. No, what I want is to keep the yellow and red parts, and remove the blue parts. Not sure if I'm doing this right to attach an image or not (it's inlined in the email). 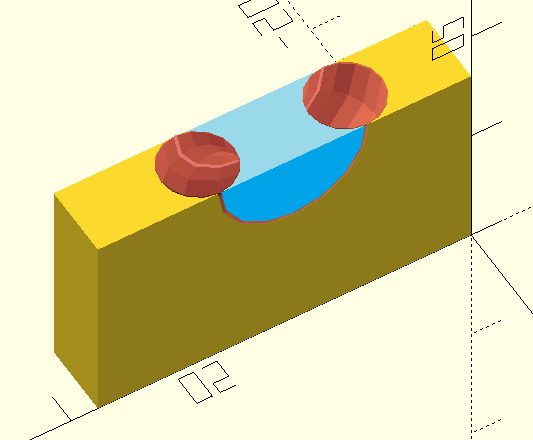 As the torus transversal section diameter is greater than the block width, the difference will produce two separate parts. Is that what you want? If so, it would be better to generate separately each part. For 3d printing purposes, you may use a lower value of $fn with the benefit of a faster render. 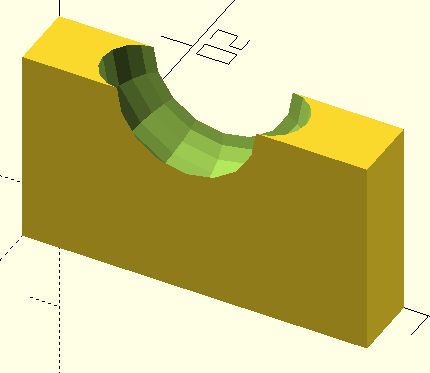 ​To get it, difference the hull of the torus from the cube. The addition of hull() gets much closer to what I want, except I want to keep the torus itself. From the previous image, I want to keep the yellow and red sections, and remove the blue. This is horribly painful to render with $fn=360 (x seconds on a 6-core 3GHz AMD), but is the end result I want (I know I can lower that for 3D printing, of course). But there must be a better way? // Fix required, or complains that it's not manifold.